See the new project page, download the source code, check the Wiki, and start developing! The visual development tool for PHP web applications. Object-oriented, event-driven application model for PHP web applications. 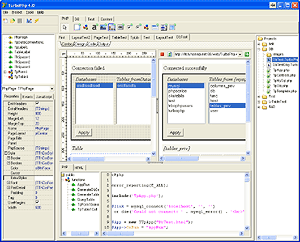 Layouts completely described by valid HTML that can be edited with standard tools. 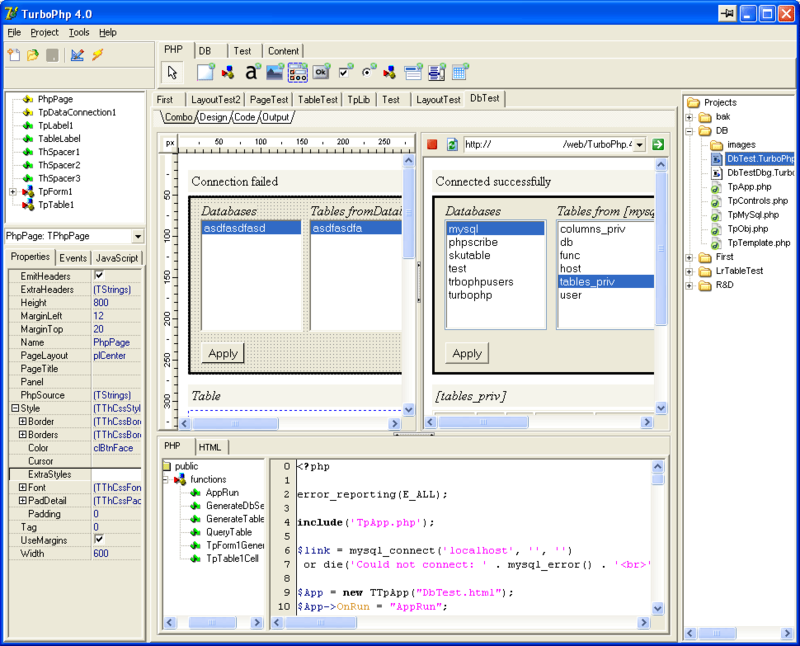 IDE with visual designer, property inspectors, and event-aware code editor. For expressive power, TurboPhp provides a powerful, drag-n-drop system for HTML layout. Use nested controls and alignments to develop complex user interfaces that translate directly to the browser. Join the TurboPhp beta team and get access to pre-release software. Beta users who provide feedback will be eligible to receive free full licenses when TurboPhp is shipped. We are releasing free beta versions of our product to ensure that we provide what you need! Help us make sure TurboPhp has the capabilities you want. TurboPhp supports dynamic data presentation that is beyond WYSIWYG. 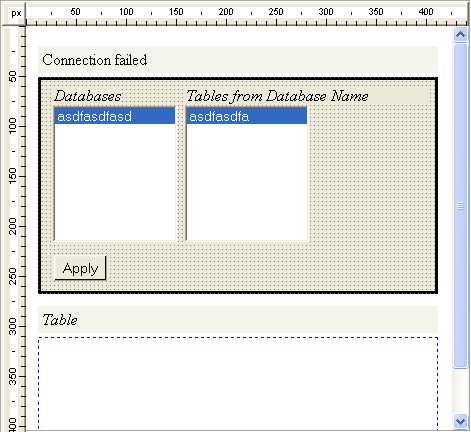 As panels or data blocks are generated at runtime, layouts expand, keeping your design intact. The layout approach uses HTML tables and CSS styles to achieve a wide range of browser compatibility without complex scripting. Drag-n-drop page design, with support for CSS2 rendering attributes, including padding, margins, borders, backgrounds, and so on. Set styles per object, or abtract style information into style sheets. Objects on your web page are represented by objects in PHP. Dynamically control the display and behavior of your web page by adjusting object properties in PHP at runtime. User clicks a button on their browser, and the button object calls a Click event function in PHP. TurboPhp hides the details of the client/server interaction to simplify building web applications. TurboPhp generated applications will work on any PHP capable system. 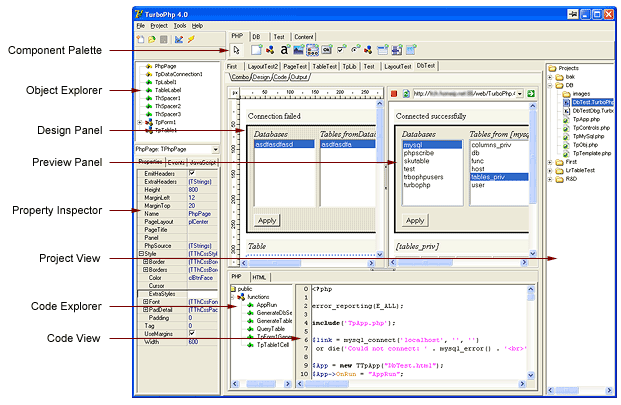 TurboPhp itself is a Windows application, but published projects are portable. The beta version is available now for free download. Licenses for final versions will be aggressively priced when available. Copyright © 2004 Least-Resistance Software All rights reserved.